Commonly used in many different industries, clevis pins are fasteners which nevertheless allow the connected parts to rotate. They are also known as link pins and hinge pins. 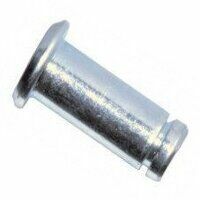 Here at Bearingboys we stock a full range and they are available in both metric and imperial sizes and are typically made of zinc-plated steel. While the clevis itself is a U-shaped structure, the pin is simply the bolt which runs through it. A normal bolt can be used in some cases, but ordinarily will not be strong enough to cope with the shearing forces it will be subjected to. Clevis pins are specifically designed to handle lateral stress. Manufactured by Dunlop.